Postcard US-1669739 to Taiwan shows the Stratosphere Tower at 1,149 ft or 350.2 m, the tallest freestanding observation tower in the United States, It is also the second tallest freestanding observation tower in the Western Hemisphere, next to the CN Tower in Toronto, Ontario. Every Friday, Saturday and Sunday in January, 2014, Nevada residents can get a free Stratosphere Tower pass for access to the indoor and outdoor observation decks with a valid Nevada ID. The general admission would cost $18. 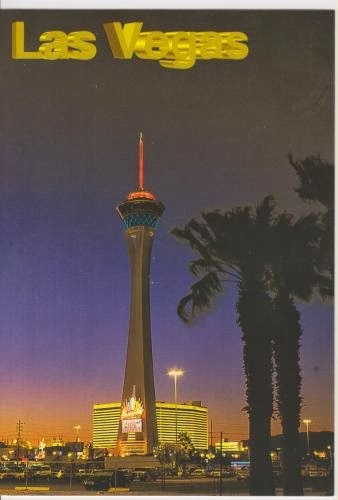 The Stratosphere Tower is open from 10 am to 1 am, Sunday to Thursday; and from 10 am to 2 am, Friday and Saturday.